This is the bee’s protein, six times as much (protein), by weight as beefsteak! Light and easily absorbed, it is ideal for vegetarians, anyone on a dietary regime and especially those recovering from illness. An excellent source of carbohydrates, it has an abundance of vitamins A, C, D, E, B1, B2, B5 and B12, as well as many minerals including calcium, iron and potassium. One or two teaspoons per day sprinkled onto cereal, salads, fresh fruit or yoghurt can result in an increase of vitality and an enhanced immune system. No time to cook? Pollen is the perfect answer as it contains every nutrient to sustain human life. A natural source of “Raw Energy”. Pollen is a wonderful energy boost for athletes and all of us with a non-stop life style. Pollen has been shown to have antibiotic properties and be effective against some strains of Salmonella. It is a powerful anti-oxidant and has shown to be very useful for those on invasive therapies, like chemo and radiotherapy. Taken in small doses, on a daily basis, pollen has been used by many, to lessen the allergic effects of air-born pollen. Quercetin, present in pollen, is a naturally-occurring anti-histamine, which can also help in reducing the effects of summer allergies. Wildflower Pollen also contains Dopamine, a naturally-occurring mental pick-me-up. This is the most complete of all apitherapy foods. 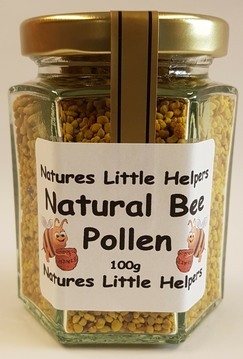 Bee Pollen also contains Lecithin which helps to remove fat stores from the body and stimulates the metabolism. Lecithin also helps in the assimilation of nutrients in the digestive process. Ingredients: Wild Flower Bee Pollen. Directions for use: Take 1 to 2 teaspoons per day as a dietary supplement. Sprinkle on breakfast cereals, salads or mix with yoghurt. Cautions: Those with a known or suspected allergy to bees or pollen should avoid taking bee pollen supplements. People who have asthma should be particularly careful. You should always follow the dosage guidelines and information on the packaging. Keep out of reach of children: Protect from heat, light and moisture. Store at room temperature.